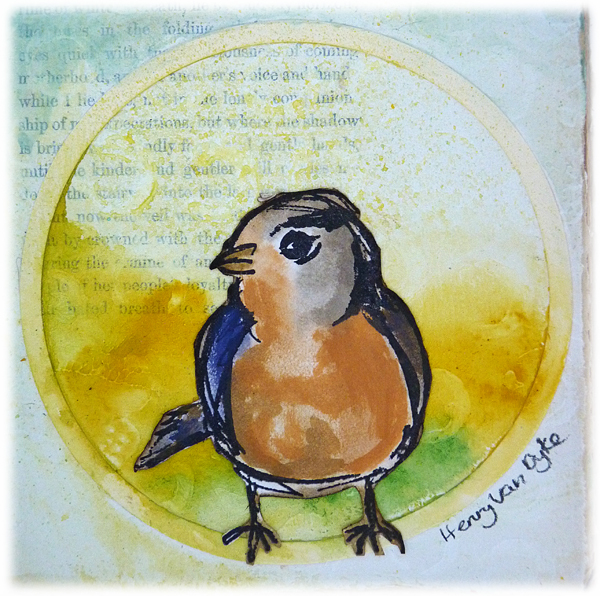 Welcome to week 22 of my Visual Journey where I am exploring techniques, products and ideas but more importantly I am just freeing myself up to create whatever comes to me rather than be channelled by themes and other peoples' ideas. Even in the middle of long hours trying to meet deadlines (like this week) I am determined to give myself that space once a week and so far so good. When I took out my journal today I had no idea where I was going to go. 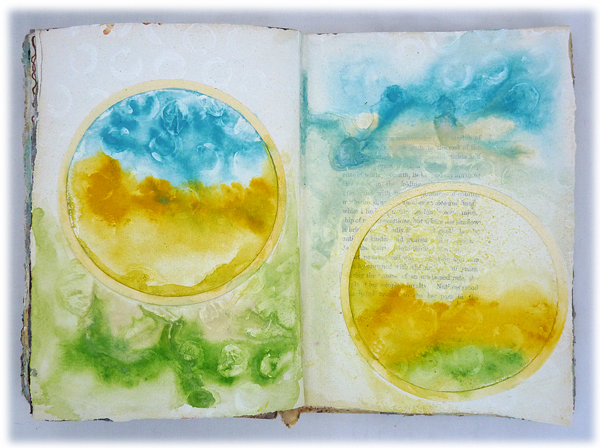 I opened the pages to find I had gessoed and textured the next double spread before I went away on holiday - but what to do? Aha I spotted bits on my desk. You know when something sits on your desk long enough you'll eventually get round to using them? Well I knew if these birds sat on my desk long enough they'd eventually come out to play. Do you ever do that? Leave things lying around because you're not sure where to put them and then all of sudden you know exactly what you want them for. 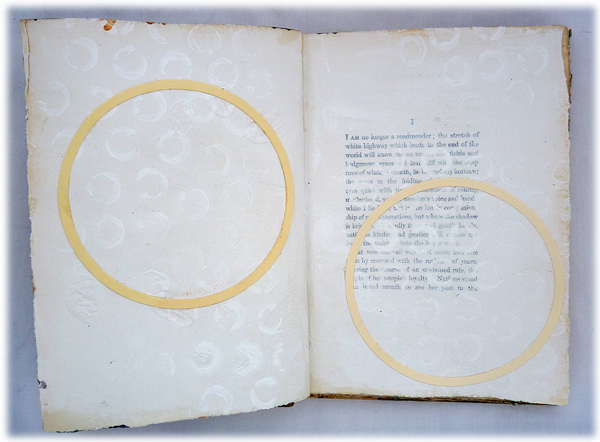 These die-cut circle frames were on my desk - left overs from this mornings prepping for a workshop, so I glued one on each page to get me going. The distress paints - why? - because again I had been using them earlier when making my tag for Fridays AVJ post - not these particular colours mind you. But I sploldged them on, spritzed them heavily with water and yay suddenly I could see where I was going. The birds would sit perfectly, one in each frame. 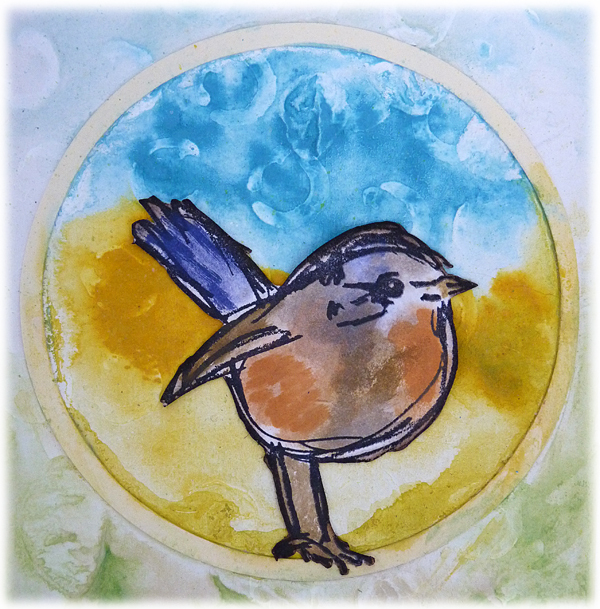 I took different coloured distress paints - daubed them on the birds, spritzed them with water and just like the backgrounds they came together, but when I heat dried them they looked rather pale. So I took a cotton bud and 'painted' some more of the colours over the top. They sat perfectly on the pages in their frames facing each other. I looked up a quote on the internet, found one I liked and wrote it in. For a moment I was going to type it out, print it and stick it in, but time is just not on my side this week, so hey ho handwritten it is. Sorry if I have not been round to see what you are up to at the moment, but I promise I will soon. Your pages are stunning Brenda. Wonderful details that you have shared with us. Those birds are so cute.........and I love to hear their song !! I really must try journalling.........looks so enjoyable. These pages look fantastic, Brenda! Love those sweet little birds. I absolutely love this! You have inspired me to open my art journal today. :) Thank you! this is a sweet page! I love those birds...where are they from? Hehehheeh - this is so fun Brenda! Love the way that you basically just picked up what was already laying there and made a fun page. Your adorable little birds look like they have the perfect window perch. Could be a hole in a tree or a log or even in a barn! Just makes me smile it's all so cute! j. So wonderful, that's an amazing spread. 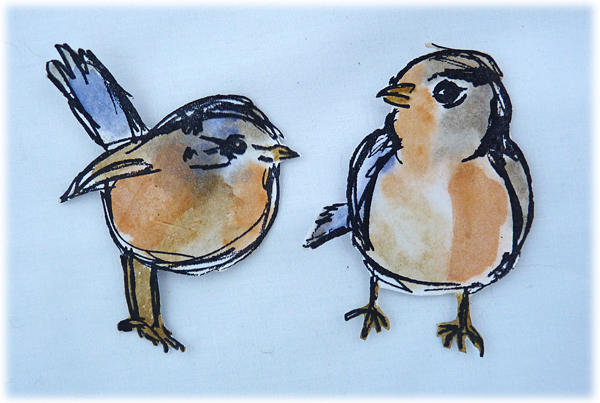 Love these birds, glad you've finally got to use them - and they are perfect, in your circles! 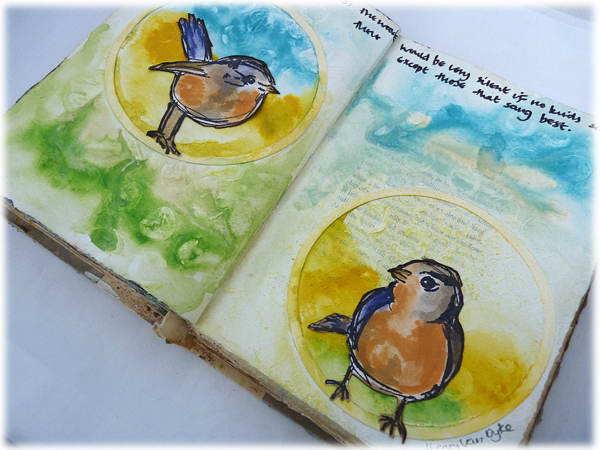 Beautiful pages... love how you created the circular frames for each bird to perch in. 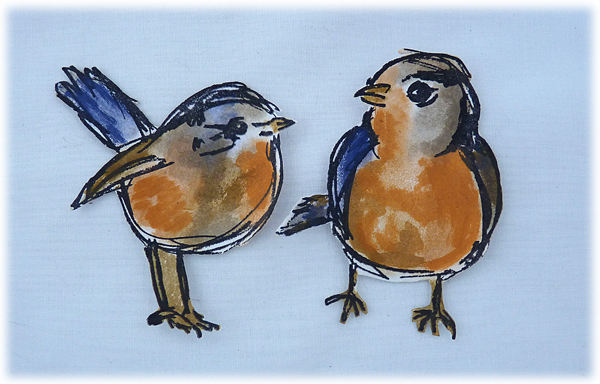 I finally gave in to these Scribbly Birds recently - awaiting their arrival from the US - and now I'm really glad I did. Lovely fresh spring time colours too, and it all feels so light and airy. 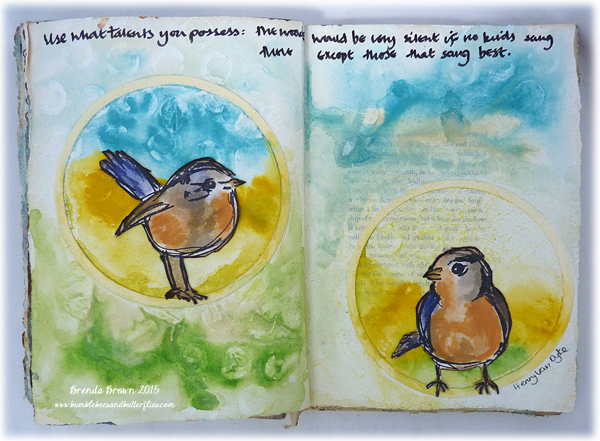 A beautiful journal spread Brenda, love how you framed the birds. Been having a catch up on all your inspirational posts i have missed recently. Those frames sure provided a nice focus and starting point. Great idea. Lovely colors too for your birds.